From 'Summer Storm' PP20443 it inherits very deep wine purple, dissected maple-like foliage that is thick and leathery. From a distance, it appears a bit darker purple than 'Summer Storm'. Like many perennials with purple foliage, this one needs to be exposed directly to UV light (grown in full sun) to achieve the darkest foliage color. 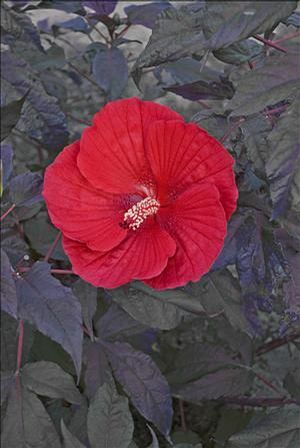 From 'Cranberry Crush' PP21984, it inherits very similar glossy, black-red buds which open to 8-9", deep scarlet red flowers. The habit is relatively compact, measuring in at 4' tall x 4 ½' wide which is intermediate in size between its parents. Since this variety is an indeterminate bloomer (has buds at several nodes up the stem), it blooms for an extended period from midsummer into early fall. We have been incredibly impressed by the growth and performance of 'Midnight Marvel' and think you will be equally delighted! Prefers consistently moist, highly fertile, slightly acidic soil in full sun. 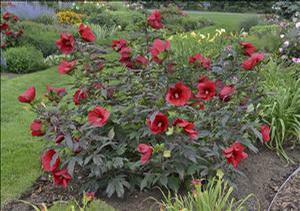 Keeping plants watered will result in larger flowers and lush foliage. Late to emerge.